Exciting news! It is with great pleasure that I announce new ownership for Thinking About Cloth Diapers! Jennifer Reinhardt and I have collaborated on projects in the past, and when she approached me about purchasing Thinking About Cloth Diapers, it was a perfect fit! Jennifer is no stranger to the world of cloth diapers - she is also the writer behind the www.allaboutclothdiapers.com blog and the associated Facebook group. She understands cloth diapers, and also has lots of ideas to build on Thinking About Cloth Diapers as a cloth diaper information website! As many of you may recall, I started this cloth diaper information website almost 5 years ago, and continued to build it during my second maternity leave. The website and Thinking About Cloth Diapers community have grown way beyond what I ever imagined - helping families all around the world embrace cloth diapers as a way to save money and leave the world a better place! Building Thinking About Cloth Diapers into the website it is today has been a real labor of love for me, but I've since returned to work full time, and Thinking About Cloth Diapers - and our readers! - haven't gotten the attention you deserve. To my dear readers - thank-you! Your ideas, support and encouragement have helped shape this website into what it is today. I have always appreciated the humble and supportive nature of our readership - unlike many Facebook pages that become divided, you have all remained respectful and supportive of each other, even when opinions (and laundry routines!) have differed! That was a vision I had in mind - and I couldn't have done it without you! 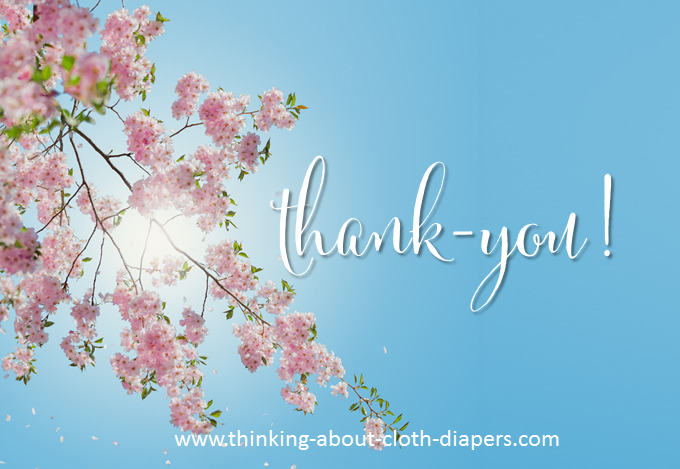 To all of the wonderful business people who have worked with Thinking About Cloth Diapers - many thanks to you! Each of you brings such passion and enthusiasm about helping others and making the world better, one diaper at a time. It's been an honor to contribute to your goals, and your support has been so appreciated! There are many other bloggers whom have helped me as well. They have acted as a sounding board, provided advice, and helped me to build and promote many of the events and contests you have all enjoyed. Thank-you, my friends! And now, please extend a warm welcome to Jennifer! She is currently working to learn the ropes on the back-end editing platform (a bit different than the one she's used to!) but I'm sure you will be hearing from her soon! If you have questions, feedback, or ideas, please don't hesitate to reach out via Facebook or email! Disclosure: This article may contain affiliate links. I am disclosing this in accordance with the Federal Trade Commission’s 16 CFR, Part 255: “Guides Concerning the Use of Endorsements and Testimonials in Advertising.” For more information, see our Disclaimer and Copyright.